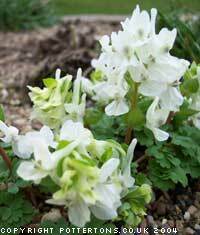 Unless otherwise stated, those offered require a well drained but cool root run in sun or light dappled shade, planted about 5cm deep. 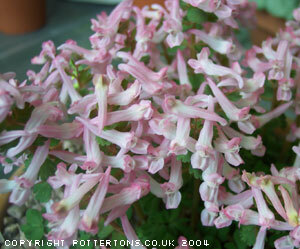 Spring flowering forms offered which then quickly go dormant, generally hardy outside in the UK. An easy species related to C. solida with many bold, solid purple flowers and lovely ferny foliage. A vigorous and robust species that flowers for many weeks in our garden from late February to mid April. 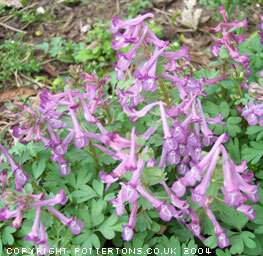 A fine cultivar which produces racemes of soft- pink flowers with a white flash on spur in March-April easy in alpine or woodland garden. 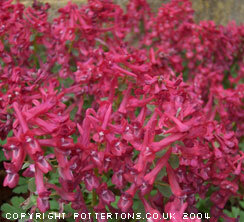 The true plant, an exceptionally fine plant of great repute with large racemes of bold, stunning red flowers. Fully hardy, well drained soil in light dappled shade. Solid purple-red flowers in early spring, hardy. A new selection, sturdy white flowers with a touch of grey to the tip of the flower, choice.